Using Bobcat earth augers, we can drill SVE wells, postholes or footings of up to 3 feet in diameter; the depth depends on the formation. 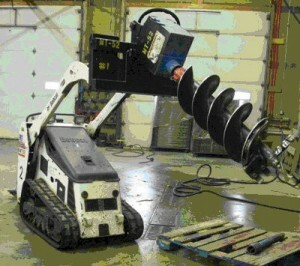 A single-flight auger can extend to 5’ below ground, with extensions available. We can also provide all other Bobcat attachments, such as backhoe or loader, for digging test pits, or the hydraulic breaker, for rock splitting and concrete breaking. Our Bobcat is 3’ wide for easy backyard access with little impact.